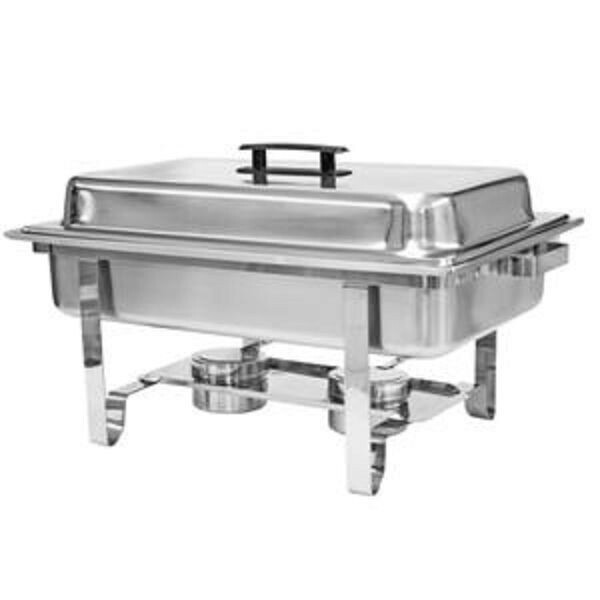 Chafing dishes or chafers are an essential piece of food warming equipment at catered events, hotel dining rooms, school and college cafeterias, and just about anywhere a buffet table sets the stage for the food service style. Even people who enjoy home entertaining have taken to using chafers to present their fine fare. Chances are you have seen many chafers in your day, but you may not be aware of the myriad of different designs, styles, shapes, and qualities that abound on the chafer market. Nor may you realize how a particular chafer style can enhance your food presentation and help to create an ambiance that goes way beyond your wildest expectations. A chafer is actually a very simple piece of equipment: it is a heated serving dish with a water pan underneath, that is heated by a canned chafer fuel flame or by an electrically heated element. The steam of the water heats the dish without drying out the food, and enables food to be kept at desired serving temperatures. The goal is to maintain the water temperature at 170°F to 190°F. 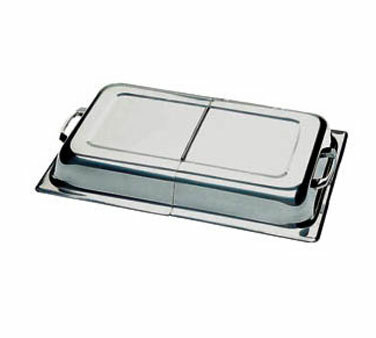 Then a food pan is inserted above the water pan where the rising steam heats the food pan, keeping food temperatures at around 140°F to 150°F. The cover then helps to keep the steam in, and is removed when the food is served. You can define a good chafer by how well it retains food warmth and for how long. But since a chafer is actually quite humble and does not involve complex mechanisms, how do we account for chafer costs and how can you determine the best chafer for your food service needs? The basic things to consider when deciding upon which chafer is best for your particular food service needs are: chafer construction, chafer size, chafer shape and chafer decorative style. Also important is: how can the chafer be cleaned and maintained; stored and transported. Most chafers are constructed from stainless steel. An economy chafer is made of 18/8 steel with a lesser weight, while a mid to high-end chafer is made of 18/8 or 18/10 steel with a heavier weight. 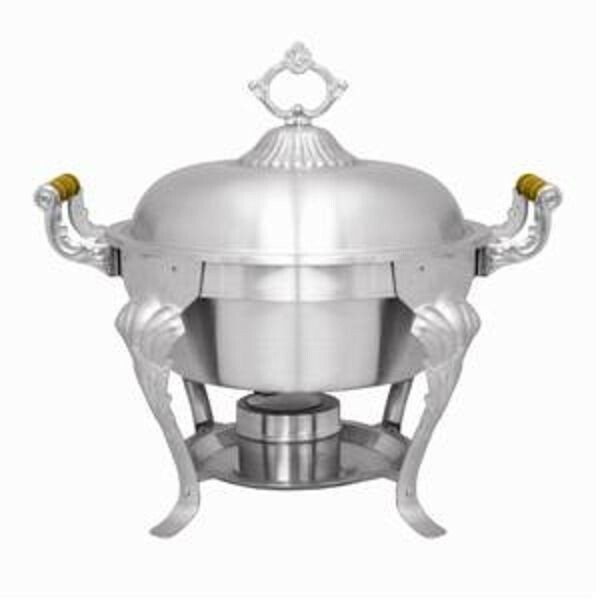 Luxury high-end chafers are made of heavier steel and are usually distinguished by their decorative features. It is important to be aware that although less costly, an economy chafer is more likely to suffer from dents and scratches due to its thinner metal construction. These types of chafers are recommended for home use or very limited commercial use. For catering, you will need to determine how often the chafers will be used, and in what type of settings and of course, your budget. 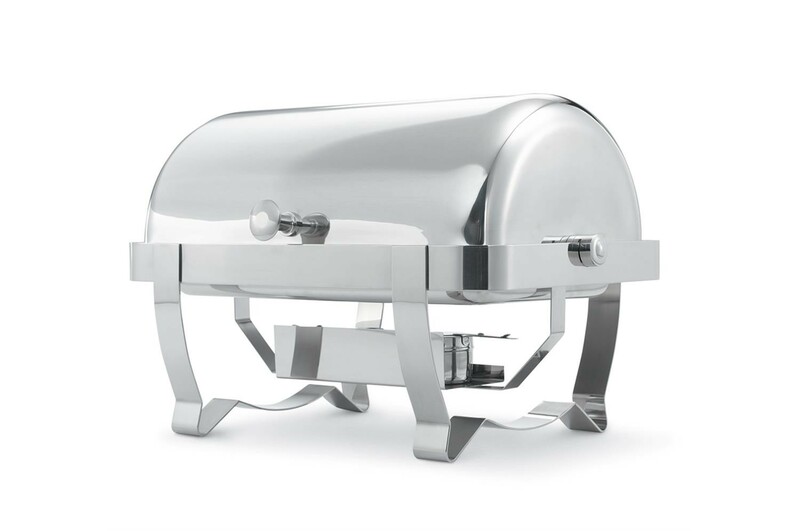 For any type of catering however, the heavier weight 18/8 or 18/10 stainless steel chafers are usually recommended, as they will last longer and retain heat better than their light weight counterparts. The shape of a chafer usually determines what is served inside, but will also serve as a decorative element for your buffet table. 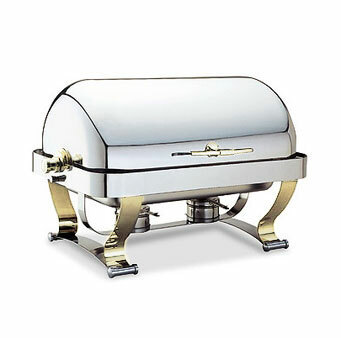 Rectangular Chafer: This is the most popular chafer shape and the one you have seen most often. They are primarily used to keep main dishes warm. 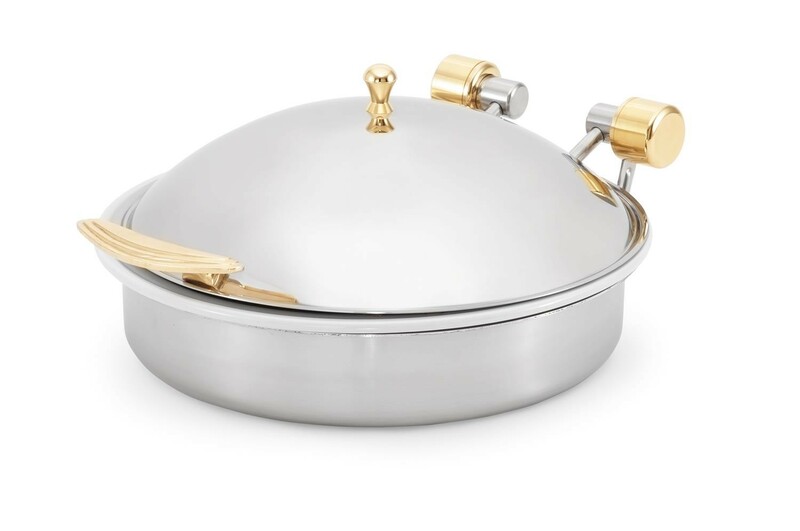 Oval Chafer: Similar to a rectangular chafer, but more with more flair, an oval chafer may also used for serving the main dish. 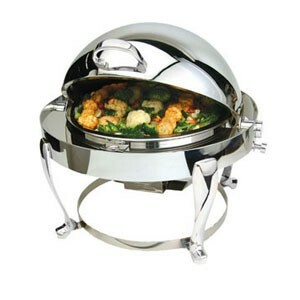 Round Chafer: Depending on the size, round chafers are popular for serving appetizers, side dishes, desserts and sauces. 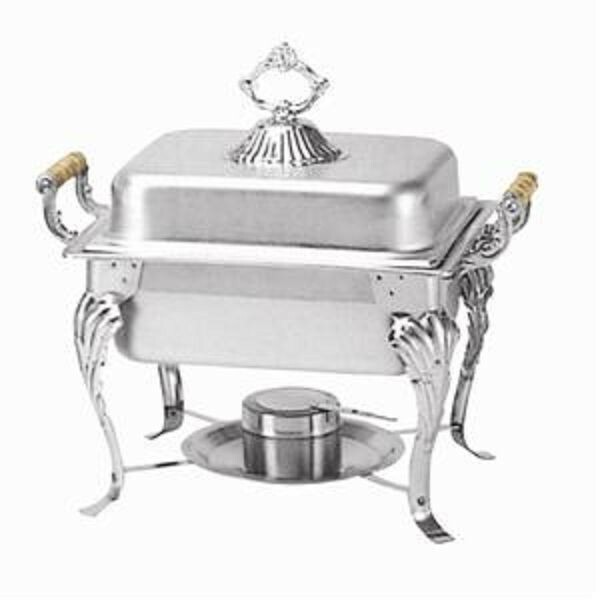 Square Chafer: Smaller than your standard rectangular chafer, these can be used in conjunction with other shaped chafers to hold side dishes or appetizers. Besides the shape, there are other features that define a chafer and whether it will work for your particular food venue. 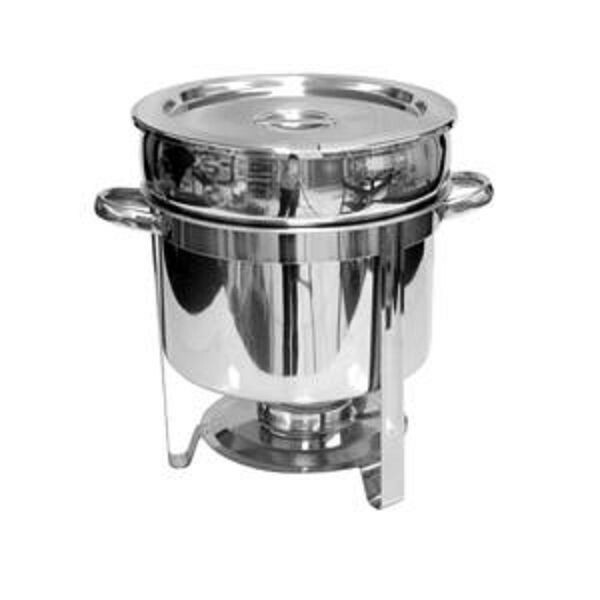 Soup Chafer or Marmite: Commonly used to hold warm liquids such as soups, stews and hot cereals. Drop In Chafer: These chafers come in different shapes, including round, square and rectangle, and are installed directly on countertops as permanent food stations. Sometimes a drop in chafer can be used in both installed applications, or as a countertop chafer, depending on the attachments. 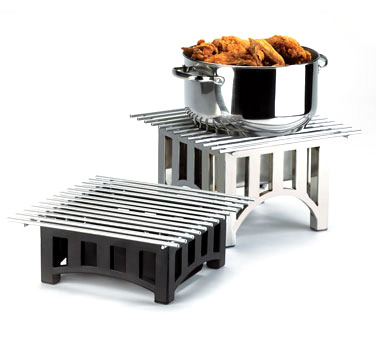 Chafer Griddle: These are used for keeping dry cooked foods such as pancakes, waffles, and more, hot and temptingly displayed on the buffet line. 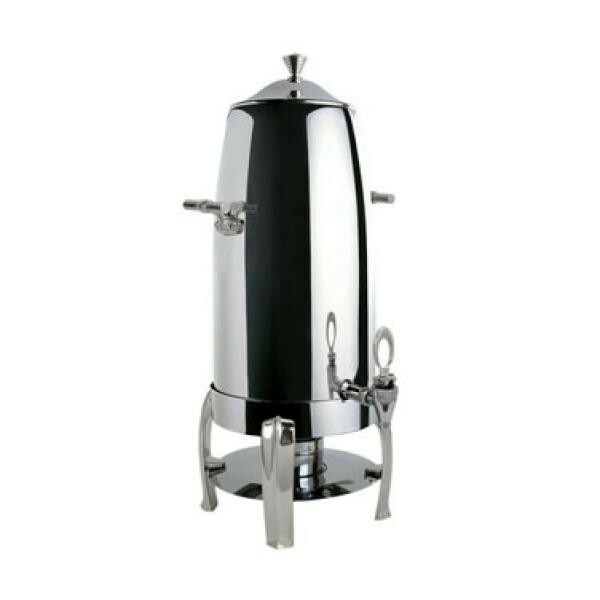 Chafer Coffee Urn: These chafers are used to attractively keep coffee and water hot on the buffet line. They come in lovely designs and will add an elegant flare to your catered event while keeping liquids hot and ready to serve. The size of the chafer, in conjunction with the shape, will help determine what you place inside. 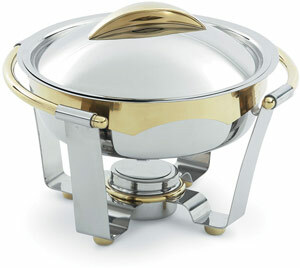 Full Size Chafer: These feature a 8 to 9 quart capacity and are usually rectangular, meant to hold main dishes. 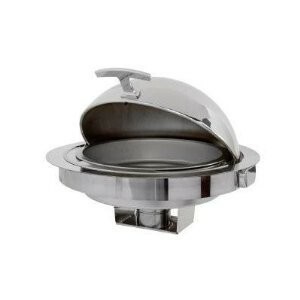 Round Chafer: These feature a 4 to 7 quart capacity and can be round or oval shape and include soup chafers. 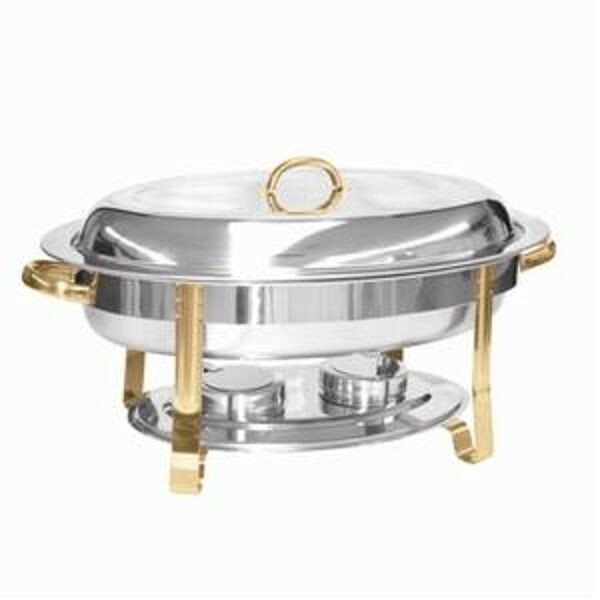 Half Size Chafer: These feature a 4 to 5 quart capacity and are usually square or rectangular, meant to hold side dishes and appetizers. An important consideration when choosing a chafer is the type of cover to choose. 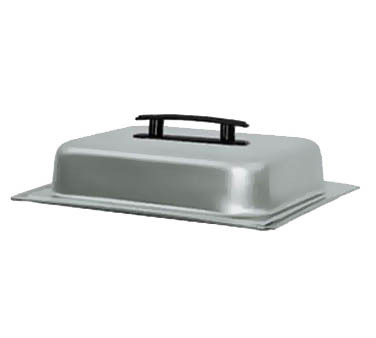 Lift-Off Cover: As the name indicates, this type of cover, often dome-shaped, can be lifted off of the chafer by using the handle on top of the lid. 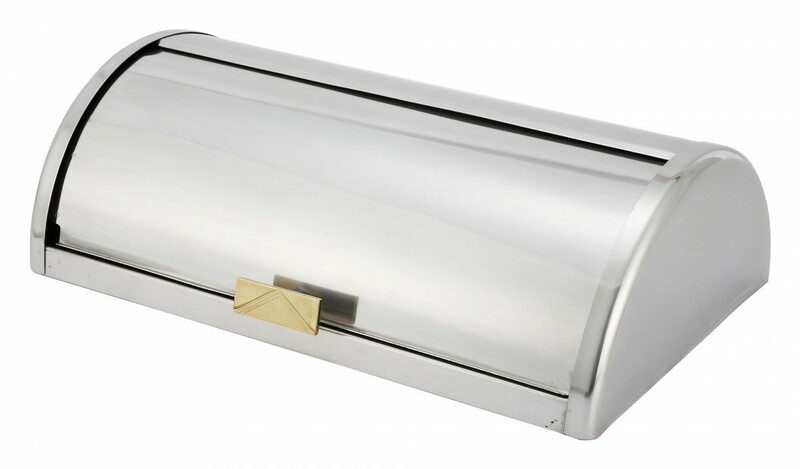 This type of cover is often found on the buffet line where servers dish out the food and the chafing dish usually features a place to hold the chafer cover, so it is not in the way. Roll Top or Retractable Cover: A roll top cover features a front handle making it easy for guests to use for self-service, mainly for one-sided service. If two-sided service is required, a chafer with a retractable cover can be used. These feature 45 to 90 to 180 degree openings for serving versatility. There are many varieties of retractable covers, with the higher end chafers offering more features. Hinged Cover: A hinged cover may look like a lift off cover, but the hinge keeps the cover in place while serving, a benefit for self-service buffet styles. Glass Top Cover: A glass top cover allows guests to glimpse at the contents without lifting the lid. 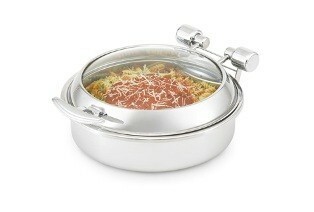 This keeps dishes warmer and makes it easier for guests to choose which dishes to taste. A chafer’s decorative style has to do with its finish as well as other features, such as handles, decorative trim and other enhancements. Mirror Polish Finish: Also known as a polished finish, is shiny and reflective, and is attractive at any type of catered event. Satin Finish: A satin finish is smooth, and although it is not reflective, it provides an upscale appearance without the shine. Matte Finish: A matte finish features a dull surface that is neither shiny nor reflective. Brass Trim: Brass trim, can usually be found on the handles, the legs or around the lid and will add a touch of class to any affair. Gold Trim: Gold colored trim, can usually be found on the handles, the legs or around the cover and will add upscale beauty to the buffet table. 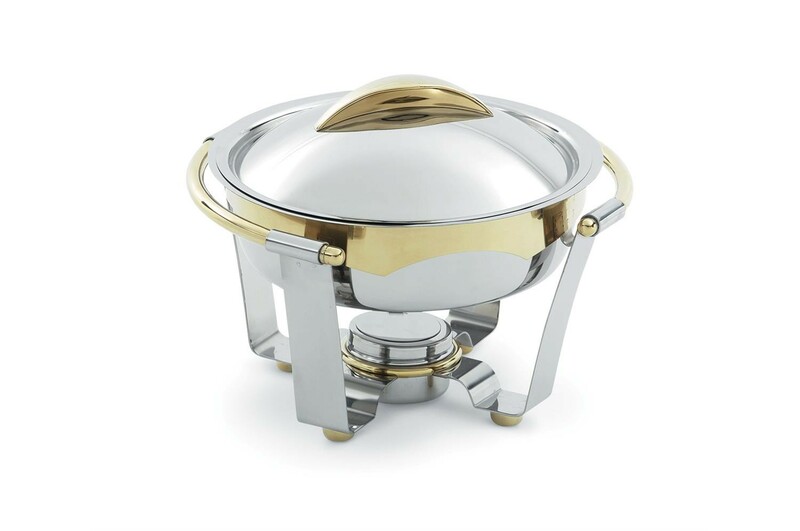 Chrome Trim: Polished chrome, can be found around the edge of the chafer and will add a delicate, yet sophisticated upgraded look to the chafer. Chafers can be heated in several ways, each of which works well in different venues. Where you use your chafer will help you decide on the type of heating style you choose. If your events are mostly indoors or outdoors with access to electrical outlets, electric or induction heated chafers may be your preferred choice. With this type of unit, you need not worry about open flames, fires and burns. If you are exclusively indoors but don’t want to worry about electricity, then the standard chafer fuel will be perfect for you. This type of heat source gives you the flexibility to set up your chafers where it best suits your decorative style without being dependent on electricity. If you are exclusively outdoors, fuel chafers may also work best for you. Fuel chafers: These use Sterno fuel cans or other types of chafing fuel with an open flame that keeps the chafer water dish heated. They provide flexibility, as you need not worry about electrical outlets. For outdoor use, a chafer wind guard can be purchased. Some find these types of chafers to be dangerous due to the open flame. 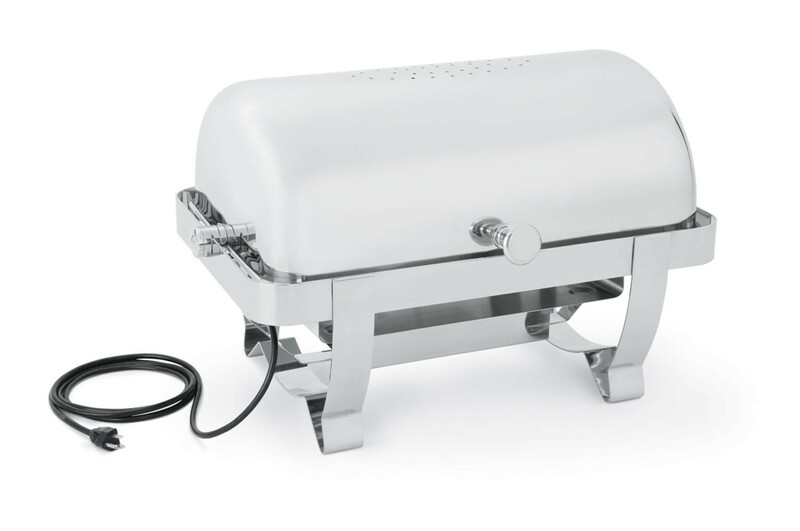 Electric chafers: Electric chafers can be used for both indoor and outdoor events wherever an electric source is available and you want to avoid any hazards caused by an open flame. But remember to always have any electric cords and extension cords that may be required, and beware of cords that may cause servers or guests to trip. 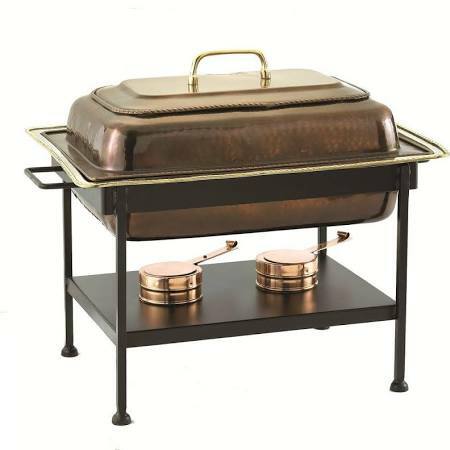 Induction chafers: Induction heat eliminates the potential hazards of chafer fuel, while utilizing the benefit of induction cooking. 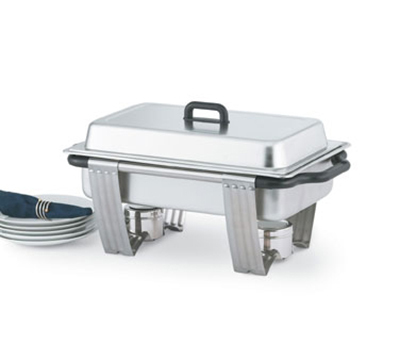 Using traditional electromagnetic induction technology, with induction plates installed in a buffet line, the chafers are placed on the plates. Heat is generated and the system maintains a constant, reliable temperature for the chafing dishes to stay warm without overheating. However, like an electric chafer, an electric source is required, with all the advantages and disadvantages. Whatever chafer shape, size, cover and heating style you ultimately choose, keep expansion options in mind. If the possibility exists that you may need to expand your chafer inventory, make sure that the manufacturers you choose offer the various styles and sizes that you may want to purchase in the future. Also important is whether you want to purchase matching accessories such as chafer coffee urns, teapots and buffet serveware. A buffet line with matching pieces will do wonders in creating a classic and upscale look. 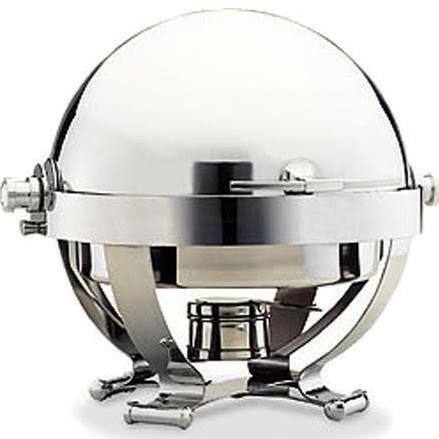 When making your chafing dish purchasing decisions, don’t forget certain chafer accessories that are really vital to maintaining your chafers. 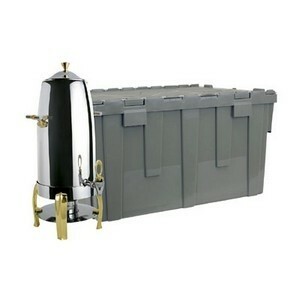 Chafer Boxes: Vital to caterers, chafer boxes are used to store and transport chafers, without scratching the surface. Usually padded, with nesting and stacking capabilities, chafer boxes ensure that your chafers will last. 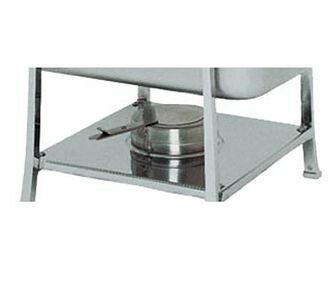 Chafer Holders: These hold lift off covers in place and keep them safely stored while food is served. On a final note, no matter what chafer style, size or cost you choose, proper operation is really the key to a successful buffet. Customers, while greatly appreciating grace and beauty, also really want properly heated, tasty food, so in order to get the best results, your servers must know how to heat foods using a chafer. 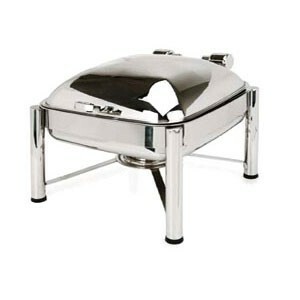 Proper use begins by making sure that the food is hot when placed into the chafer food pan. Food that has cooled off will never maintain the same quality as food that has been consistently kept warm. Your staff will also need to make sure that the water in the water pan is hot when you add the food. The heat source itself is not meant to heat up the water in the water pan, but rather to maintain the heat. If this is not done properly, the food will have time to cool down while the water is brought to a steaming temperature.